PHP Framework Vs CMS: which should you pick for business website? Home /PHP Framework Vs CMS: which should you pick for business website? It has always been a tough choice for the individual to make a selection between these 2 technologies to meet their website development desires. Before making the choice the individual should know about CMS and PHP frameworks and their importance in web development. Here are a couple of tips and distinguishing features between CMS and PHP frameworks to assist all those businesses out there wondering which might suit their needs the best. CMS stands for Content Management System. As the name implies, CMS gives the business owner, the power to manage the content of the website. The benefits of using cms are it helps to regulate, edit, manage website’s content effortlessly. 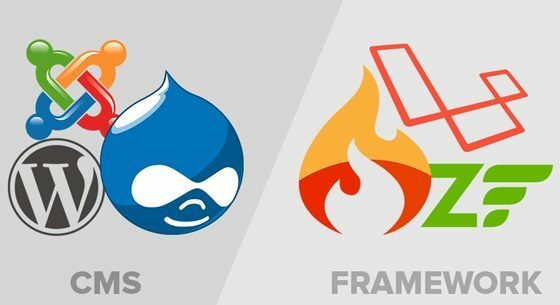 The foremost common CMS choices include WordPress, Drupal, and Joomla. On the other hand, PHP frameworks are based on user-written, customized codes inside a promptly outlined set of rules. It’s possible to develop an extremely customized website with PHP frameworks. The actual users of PHP frameworks are technical users. A non-technical user would drift in the programming language and functions of the website. Popular PHP frameworks are Laravel, CodeIgniter, and Zend Framework. Today for an online business, security is that the biggest concern. Hackers try out new ways to attack a website, to destroy or to vary the way the website looks. This can decrease the worth of a business website. Most CMS is open source and also the code base is open to everyone, therefore, it’s additionally vulnerable to security threats. Websites developed using PHP frameworks are safer as compared to CMS. Since they use custom code, it’s more difficult to breach their security. Based upon business necessities, your website may have to own varied functions and integration with third-party applications. Typically you would like your website to perform operations that are independent and connect with numerous systems as well. Whereas CMS sites will have a range of functions in applications, those applications aren’t terribly versatile. Since the applications are pre-made, creativity will typically be restricted. PHP Frameworks contain varied library functions and might be easily customized based mostly on the wants of the business. CMS make it terribly easy to manage the website content. The business owner can change data on the website without a problem. With frameworks, developers need to specifically use the library functions and alternative third-party tools to develop easy interfaces for websites. So, if you want to enrich the user experience then choosing CMS would be a better choice. Getting your business website updated with the latest code functions is basically necessary. Upgrades facilitate with website security. CMS has updates almost every month. Even if not updated, the website would operate, however, the site wouldn’t be as secure or easy. Most PHP frameworks have updates regarding new options, however not monthly. Some will go six months without updates and still be secure and functional. Giving a conclusion in favor of anyone would be the injustice. Choosing the PHP framework or a CMS will purely depend on- what quantity time a developer is willing to spend? and how flexible does one wish your project to be?. In short, To minimise the risk of a serious interruption to your website, choose the right website Development Company who has enough expertise to know the pros and cons of every technology solution. Selecting Website development services from Genuine Website development company can uplift the business status by providing best solutions.